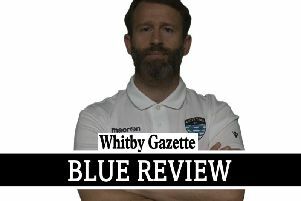 Angel took a step closer to wrapping up the Scarborough News Sunday League Division Two title with a hard-earned 3-1 home win against Ayton Reserves. Ali Caw opened the scoring for the hosts after 15 minutes, cutting in from the wing and hammering a shot into the top corner past Ayton keeper Shaun Dolan, who managed the villagers in the absence of boss Steven Frederiksen. Caw then beat his man wide and his shot was shinned in by Ayton defender Nathan Sutherland, Dolan pulled off two further fine saves before half-time to keep his side in the game. The win was secured on the hour mark, as a dominant home side made it 3-0 when young sub Benny Davis beat the offside trap to latch onto a long ball and slot his shot into the bottom corner. Ayton claimed a deserved consolation goal on 70 minutes, Dave Phillips neatly setting up Si Coupland to fire the ball home. Caw was named as the hosts' man of the match with great play from new signing Michael Hernandez at centre-back. Central midfielder Luke Dunn was the star man for Ayton, with Coupland, and the other three men in midfield all playing superbly to keep their team in the game against the leaders.